Above you can see my smaller fish tank when this thing was still ok. Back then, me and my cat enjoyed to chill out on the couch near the fish tank in the evening because the lights of the fish tank were really relaxing. We both enjoyed it. Overtime I got some trouble with the fish tank. I tested all water parameters regularly as I am very well-known about fish tanks and couldn’t find any issue, but still some fishes died each week so that I had not any left after some months. I think there was some kind of disease that did let my fish population cease. I was sad, of course because of the fishes, but also because you put so much efforts and money into it. The problem is that the fishkeeping stores in our city are not that good. I had it once that I bought fishes that did look really bad. I do think they don’t take very well care about their water. What could I have done, killing the sick fishes I got? Of course not, I thought I could raise them up and save some of them. Well, I think this is how I basically did contaminate my fish tank with a disease. So, the lesson is to take much more care what kind of fishes you buy, I mean where you buy them, or better, not to buy in stores where it is apparent that they don’t take care about the water quality or fishes as well. As there were no fishes anymore and as I did not buy new fishes to keep the population, I decided a while ago to empty my fish tanks. I think it was the right decision as I would just have put more and more fishes into it that would get the disease as well. I am also not really a fan of the chemical stuff you can use to treat the diseases, it’s just something else that the store that caused the problems wants to sell you. Apart from that, I have read about it and the first thing I thought was that it is definitely something I won’t put in a fish tank, as I heard other opinions of people who had even more trouble after they used it. I am still interested to keep this hobby, because it’s really fun. It’s just that I need to find a better store and if I find one, I might set up my tanks again this summer. But only if I decided to buy me a DSRL camera, as this is something with highest priority on my wish list. But after that I might get into my fish hobby again, but I don’t know yet. In case I will do, I maybe even should rather buy fishes from private breeders who take care about their tanks as I did. Let’s see. Anyway, I still have some photos and videos of my fishes that I might upload to my blog over time. It must have been very disappointing to lose all your fish and if you do start fish keeping again buying from a breeder sounds sensible. Did Shyna ever try to go after them? Yes it was very disappointing. I had this species called Mosquito Rasbora in my smaller tank. They are tiny and don’t grow much (not much more than 1.2 inches or 3 cm) so that you can hold quite a lot of them even in a small tank. At some point I had 40 of them when I remember right. It sounds much but then if you lose one or two each week, the number does decrease. It happened very slowly and as it is hard to count small fishes, I didn’t even notice it for a long time. I started to notice it when it became apparent that there can’t be more fishes than 20 or so. This species is master in hiding behind plants, in fact they do love shadow areas which made it even more difficult to notice as I always thought “Looks like there a less fishes now, but I bet they are just swimming behind the plants in the shadow area”. So, when I had no fishes anymore, it made no sense to keep the water running for the plants only. I was sad when I did empty the remaining plants because there was basically a garden dying, an underwater garden. It was fun and relaxing to work in the tank once a week (water change, cutting too much grown plants and so). But I was more sad about the fish population of course. 🙂 When I saw that photo the first thing I thought was “Cat TV”. I guess it is a lot easier to cat proof a fish tank than a bird cage. 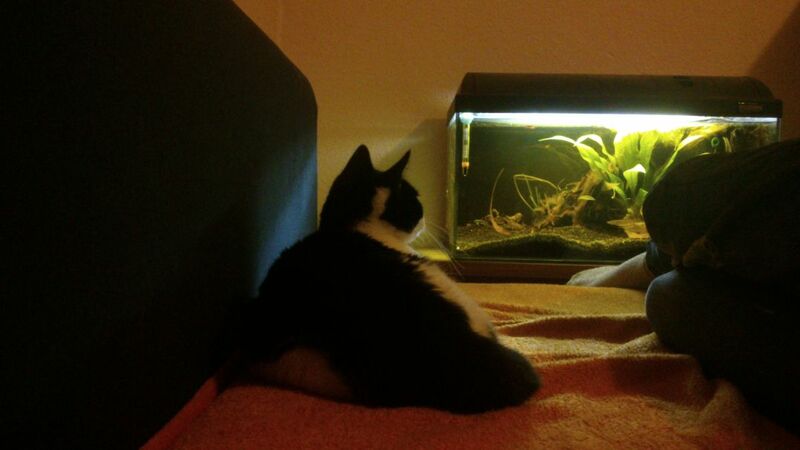 Haha, yes, it basically is a cat TV if the fishes are big enough to be noticed 😀 I think you are right, I wouldn’t trust Shyna if I had birds. She probably would try to attack the birds and the cage wouldn’t really be a hurdle for her claws 😀 Yes, fish tanks are much safer due to the lid unless you have one without a lid because they are available in stores too.